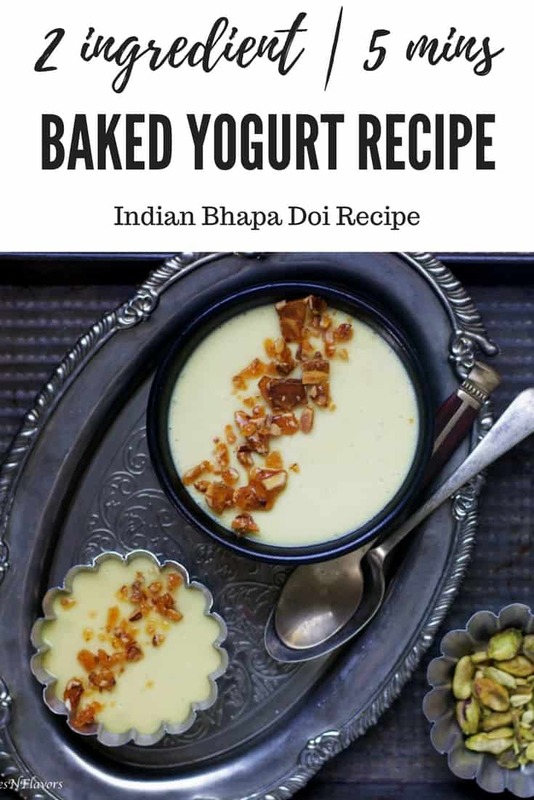 Baked Yogurt or call it Bhapa Doi; a traditional Indian dessert that is surprisingly super easy to make. Are you looking for a simple and easy dessert recipe using Yogurt then look no further. 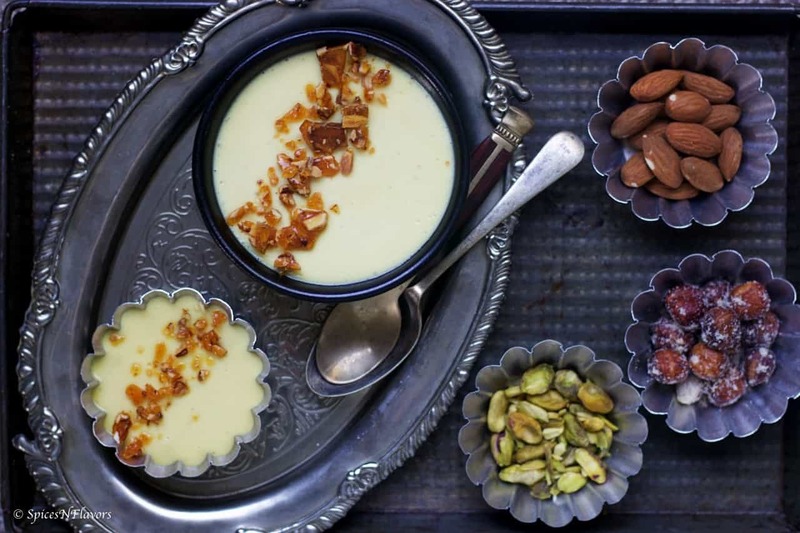 This Indian Baked Yogurt pudding recipe needs just 2 ingredients and 5 mins of your time. Hmmm.. Call it by any name; make it traditional or fancier westernised the outcome is a luscious, smooth, lump-free and perfectly sweetened and flavoured dessert. Rest everything is just flavouring agents which is actually optional or you can customise it as per your liking, season or mood. Cool right!!! Why is this Baked Yogurt dessert recipe a must try one? 1. Like I said just 2 ingredients. An Indian Sweet using just two ingredients is absolute must try recipe. 2. 5 mins of Prep Time or Active Time is all you need. 3. Perfect make ahead dessert. Makes it ideal for parties. 4. Make it in any form, size or shape. Bake in a cake tin or ramekins it is totally up to you. 5. Can be customised as per mood, flavour, season, theme just endless. Have you ever wondered, what can I bake with Greek yogurt? Then let me tell you I simply love using Greek Yogurt in baking recipes. It is also a great substitute for eggs in baking. Generally, it can be substituted for recipes that call up to 2 eggs in them. And baking with Greek yogurt is so much fun because it is so thick naturally that you can directly use it in any recipe. In fact I made a Chocolate Yogurt Mousse Tart sometime back using this Greek Yogurt and trust me guys it was just amazing. But I get it.. some of you might not find Greek Yogurt in your city. Then what would you do? It is really simple. All you have to do is hang the yogurt in a cheesecloth for a while; all the whey will drip off and you will be left with nice and thick Hung Curd. You can use that and follow this Baked Yogurt Dessert recipe. Can’t believe we are already in Mid June. Where did all the days go? I for one absolutely love the other half of the year. Do you know why? Any guesses? Ain’t it obvious.. That’s because in just a few days we have all the festivities coming up. Be it Indian festivals (let me not start naming everything now the list goes endlessly ;)), Thanksgiving, Christmas or New Year everything will be here in no time. 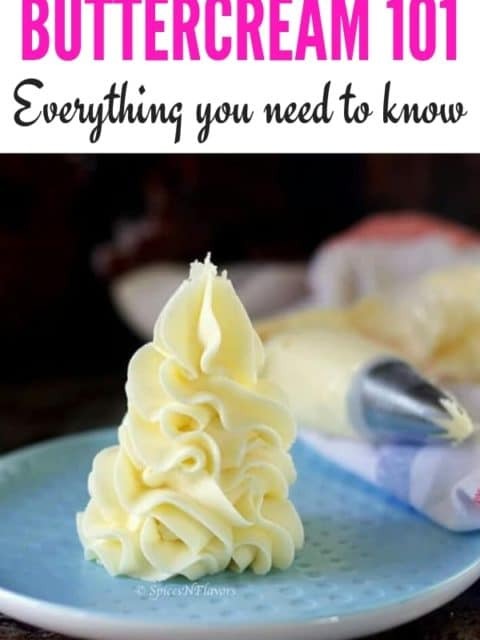 And in all the hustle bustles we are always in the hunt for some quick, simple and easy Indian Sweets recipe or some cool and fancy dessert recipes to impress our families right!!! 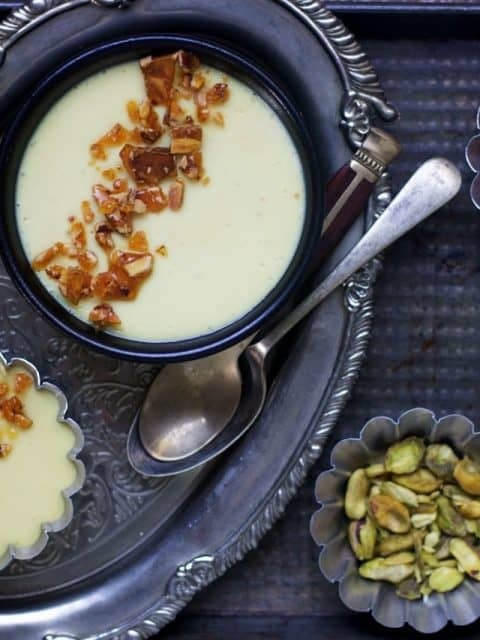 One such recipe is this Baked Yogurt Dessert recipe or Bhapa Doi recipe. 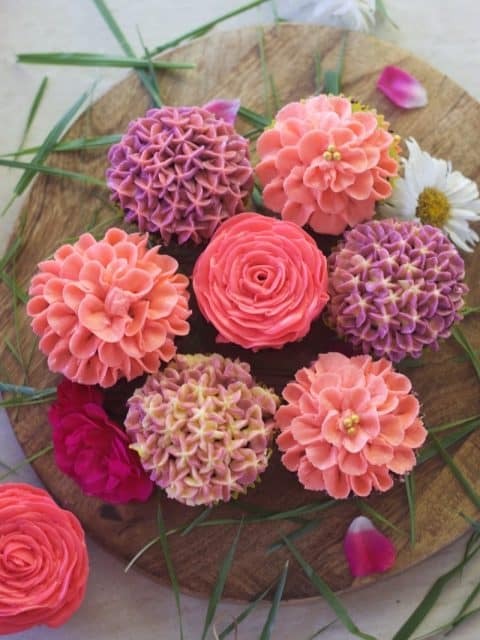 You won’t believe how easily and quickly it can be made. 1. Butterscotch Sauce – it is a 5 mins super simple recipe that I have already shared before with you all. You can click here for the recipe. 2. Almond Praline – Praline is basically some caramelised sugar mixed with nuts which is then allowed to cool down so that it becomes crunchy. This recipe also I have shared with you all a couple of times like in festive Kalkandu Pongal recipe or Toffee cookie. You can check it from there. 3. And lastly, some butterscotch essence to further enhance the flavour. And I would describe this Baked Yogurt dessert as a smooth, sweet pudding-like texture with some crunch here and there from the praline and the butterscotch flavour hitting you at the right notch. If you are someone who wants to make this recipe even simpler; then do not worry I have got you covered for that too in the notes below so definitely read this till the end. For now here is the detailed recipe for you guys. 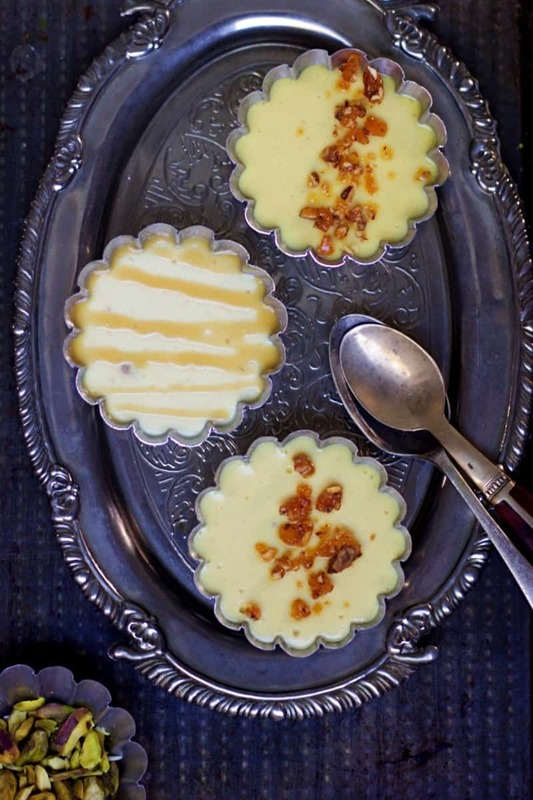 Baked Yogurt or Bhapa Doi is a smooth luscious pudding recipe with a crunchy praline and is flavoured with butterscotch sauce. In a mixing bowl, combine together all the above ingredients. (Reserve some praline to garnish on top). Mix it using a wire whisk until combined and lump-free. Divide it evenly in between the ramekins. Cover it with aluminium foil. Transfer the ramekins to a baking tray. Add some warm water thereby creating a Bain Marie system. Bake in a preheated oven of 180°C for 15 mins. Switch off the oven after the 15 mins time interval but let the ramekins sit in the oven itself for another 10 mins just to ensure that it sets completely. After that place it in the refrigerator to chill for a minimum of 2 hours or preferably overnight. Next day you are ready to serve these beauties. Garnish it with some more praline and you are sorted. How to make Baked Yogurt in Steamer? Once the water in your steamer starts steaming, just place the aluminium foil covered ramekin in the steamer and steam for 12-15 mins. As simple as that. Let it chill in the refrigerator for min 2 hours or preferabbly overnight and you are done. How to make Baked Yogurt in Microwave? Making this dessert in the microwave is like a Joke!! I mean.. just read on.. If you are just baking one single ramekin then microwave it for just a minute. And if it is 3-4 ramekins at a time then microwave for 5-6 mins. 1. In place of Greek Yogurt you can also make use of regular yogurt. Just make sure to hang them for a while (couple of hours) so that you get thick Hung curd. 2. Do not start with sour curd as better the taste of your curd the better your end product would be. 3. Sweetness can be adjusted as per taste. 4. I have already shared the recipe for praline a couple of times before like in this Toffee Cookies recipe or Kalkandu Pongal. You can get the exact recipe from these posts. For today’s recipe, I have used 25 gms Sugar, 2 tsp Water and 2 tbsp almonds. 5. Again the butterscotch sauce is also homemade. You can get the recipe from here. 6. If you are using store bought sauce then you might want to adjust the sweetness of the recipe as per that. 1. Even though the butterscotch sauce just needs 5 mins of your time to make it. If you are in no mood to make one then definitely you can use caramel flavoured condensed milk directly which is easily available in the market. 2. Likewise, instead of praline, you can definitely use butterscotch chips for the texture. 3. 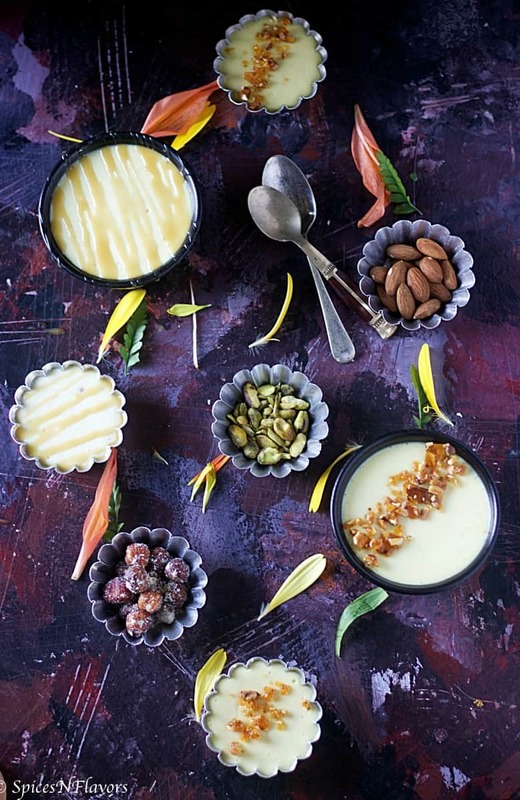 Any flavouring of your choice like just plain vanilla essence, mango pulp, some mixed dry fruits, caramel sauce, any kind of coulis on top can be used to flavour up our basic Baked Yogurt recipe as per your choice. Baked Yogurt dessert recipe is a smooth, creamy and delicious pudding-like dessert that can be made with just 2 simple ingredients – Yogurt and Condensed Milk and needs just 5 mins of your active time. 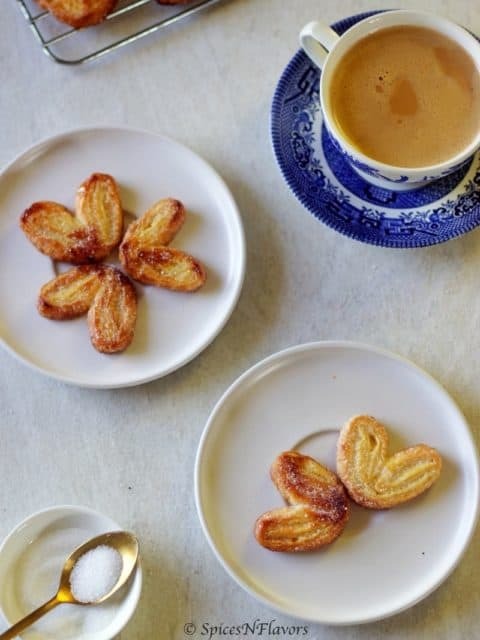 One Indian sweet that can be made so easily and hardly any efforts needed making it perfect for your dinner table for celebrating any Indian Festivals. Hey dear this sounds just yummylicious…is there a substitute to covering these with foil…can I cover them with Something else…? The point is to not let the steam out.. You can try using a silver plate if baking it on a steamer. Not sure of any other substitute.